When read today’s weekly photo challenge and saw the prompt was the word “unexpected” I couldn’t think of a single image in my photo roll to post. This lack of inspiration was in itself unexpected because I usually have an idea pop up right away and today I had nothing. I thought about unexpected moments while I worked through the rest of my day and remembered some great old stories but nothing that could be illustrated with a picture. After school Ryan and I walked through downtown and since it was still on my mind I asked him what he would post today if this was his blog. 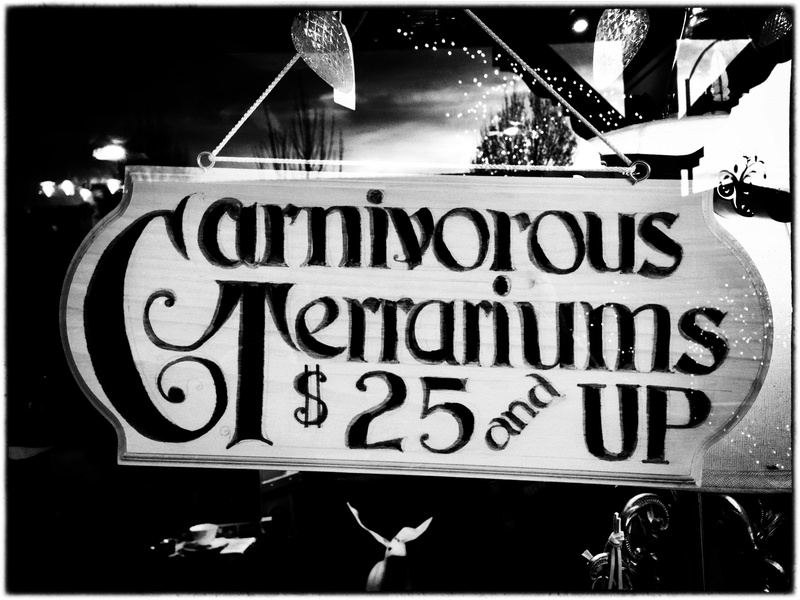 He turned around, pointed to this shop window and said “look at that, I’ve never seen a Carnivorous Terrarium before”. Ok, an unexpected moment, a sign that is amusing and an interesting picture to illustrate it. Check, check and check! My phone is always in my pocket and ready for pictures. 🙂 Thanks for sharing your comment! Great questions. 😉 The sign definitely stopped us in our tracks to look a little closer. I’ll admit they were full of Venus flytraps but I like your bearded dragons in clown suits better! Sometimes ideas find us, without looking 🙂 A cool post! Fascinating! What a great idea for this challenge! Don’t you love kids! They are so creative and imaginative! Great post. You are welcome as ever Lisa !